I returned home this month from a delightful jaunt through England (and a little bit of Scotland). During the trip, butterflies emerged as a recurring theme. I’m collecting moths for a collage, but butterflies seem to market themselves more effectively. Damien Hirst’s show at the Tate Modern had a whole room dedicated to live butterflies. Plastic ribbons cordoned off the doorways, and special assistants removed errant butterflies from hair and clothing. Photography was forbidden, so all my butterfly photographs are from other venues. The butterflies hatch from pupae on canvases and fly around the room to feast on fruit and a few begonias. Patrick Barkham has written more about the emotional experience of the butterfly room here. I walked through the Hirst exhibition in a haphazard way to avoid the crowds. However, this meant that I saw the butterfly canvases (wings glued to canvases in the style of stained glass windows) prior to the live butterfly room. The butterfly collaged canvases changed and glittered in the light, the blue Morpho wings would briefly have a pearly lustre and change back to a bright blue. Changing my path through the exhibition meant that the butterfly room seemed unnatural, as though the butterfly paintings were reanimated. After regaining life, they escape capture only to be sentenced to stay in a very small room. Closer to home, Genevieve Swifte’s art uses butterflies in a more subtle way, to mimic cloud patterns. Swifte creates her pigment by mixing butterfly wings with silver leaf and binder on paper. In “A Study of Clouds I-II”, the scales catch the light and simulate the shifting nature of clouds. The drawings make the connection between flight, air, weather and creatures that inhabit parts of the sky. The drawings are so delicate that the effect is best seen in person, otherwise they may be viewed on Swifte’s site here. 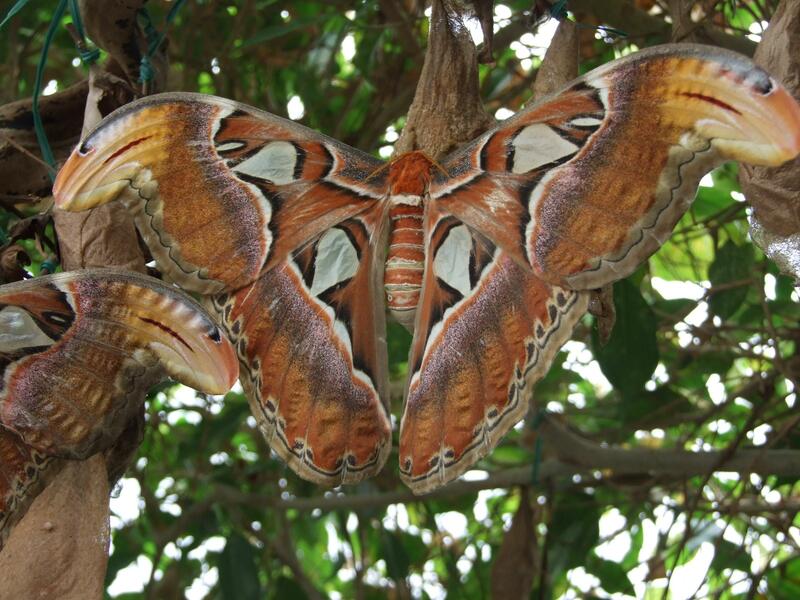 I also saw a giant Atlas moth at the ZSL London Zoo – but the ones that Sloane Crosley found irresistible (mentioned in her book, I was told there’d be cake) were at the Museum of Natural History. There was also a great moth talk in the Natural History Museum’s Wildlife Garden. I visited two butterfly houses – Edinburgh Butterfly & Insect World (Edinburgh, Scotland), and Butterflies and more (Congresbury, UK). Butterflies and more is tricky to find, but is worth it for the established banana plants, eager turtles, and multitude of Morpho butterflies. The Morpho is my favourite butterfly, because their lustrous shimmering wings (as glued on Hirst’s canvases) are like a special surprise present. When closed, the wings mimic a brown owl, and when opened, expose a brilliant blue. It’s the nature equivalent of a surprise egg (bath bomb). The inner vivid blue is an easier beauty to appreciate than the brooding camouflage variations of the undersides of the wings. Perhaps a preference for either one could be a personality test!